A freshly picked strawberry is brilliantly shiny and plump with a bright green top still attached. Berry color alone is not enough to determine good flavor as color varies among varieties, but the darkest berries of any one variety will be the ripest. "Farmers Market" Strawberries (when in season) available by the flat only. Only the ripest berries need to be refrigerated. Berries that are under ripe will improve if they are allowed to sit out at room temperature, overnight, in a single layer. 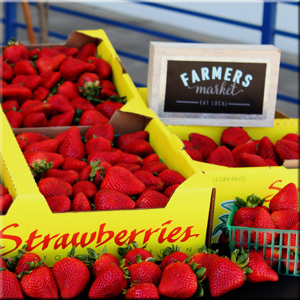 Strawberries are low in acid; their flavor can be enhanced by slightly acidic foods like oranges, red wine and balsamic vinegar. The strawberry is, in technical terms, an aggregate accessory fruit, meaning that the fleshy part is derived not from the plant's ovaries but from the "receptacle" that holds the ovaries. Each apparent "seed" on the outside of the fruit is actually one of the ovaries of the flower, with a seed inside it. In both culinary and botanical terms, the entire structure is considered a fruit.